Today we take a day to celebrate all the things that are good about America. Freedom, fireworks, and shoving as many hot dogs down your throat as possible. Yes, today is Tim Hardaway’s favorite sporting event, the Nathan’s Famous July Fourth International Hot Dog Eating Contest! Ladies and Gentlemen! We have a new World Hot Dog Eating Record! The record is back in American hands! 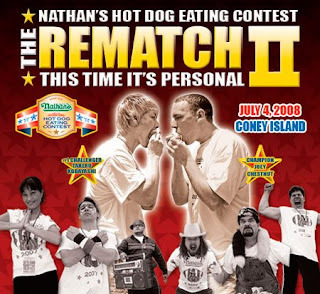 Joey Chestnut shattered Takeru Kobayashi’s record. Kobayashi had eaten 53.25 hot dogs in 12 minutes. Chestnut ate 59 at a qualifying event at Arizona Mills Mall in Tempe, Arizona.